Here is another delicious low carb recipe brought to you from Happy Haute Home. Whether you are following the Atkins, Ketogenic, or Paleo diet, this one is a sure winner. 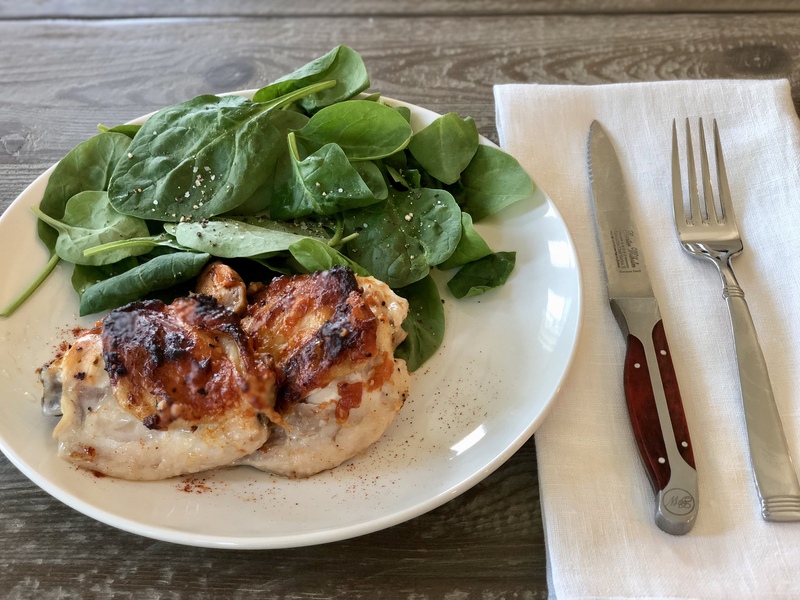 I have made this recipe so many times, now I buy a large pack of 8-10 thighs and quadruple the ingredients so I can eat this meal for a week! Here is what you will need to get started. This recipe is from the ruled.me cookbook. Combine all sauce ingredients together in a small container. Mix until a thick paste is formed. Debone the chicken thighs if you wish and pat dry. Season both sides with salt and pepper. Coat the chicken with sauce on both top and bottom. Lay the chicken thighs on a wire rack over a baking sheet. Bake for 40-50 minutes until skin is crisp and charring appears. Enjoy your low carb meal with spinach or vegetables, the chicken is very tender and has a fabulous tangy taste. If you try this recipe, let me know! I love hearing from my readers. For more yummy recipes, subscribe to Happy Haute Home and follow along on Pintrest HERE, and Twitter HERE and feel free to pin and tweet your favorite pics from Happy Haute Home. Sounds yummy, I think it’s just what I have been looking for in the low carb diet. This recipe is real easy to make and great tasting, I hope you like it! You should give it a try! It’s so easy too. Great recipe! I love it! YAY! It’s worth the effort, small investment pays off big. Yes definitely! Love low carb recipes, a few ingredients can really add to the flavor or the chicken. Yes this is a good one!